Picture from group : View from Car Park, with Common Mt behind. Picture: View from Car Park, with Common Mt behind. Common Mountain is isolated from most other hills by its location in the apex of a narrow fork of land, where the N56 meets the R230. For the easiest ascent, it is hard to ignore the lay-by parking at G687 859 A, which is already at an elevation of 270m. From here you need to outflank the forested area, either by heading northwest along the road for 100m, or southeast about 100m to the hairpin bend, before heading south over open ground. Once around the forest you can head east towards the summit. An hour should see you at the summit and an up and down should take well under two hours. An alternative is to start right in the hook of the hairpin bend, where you'll see some small hills of gravel. Behind these is a gate. This has a 'Private Property' sign, but judging by the towering weeds on either side, it hasn't been opened in years. Across the gate is a short track leading down to a stream. Cross this and you are onto to the open hillside, which is grassy and firm underfoot. Head directly east for an hour to reach the top. 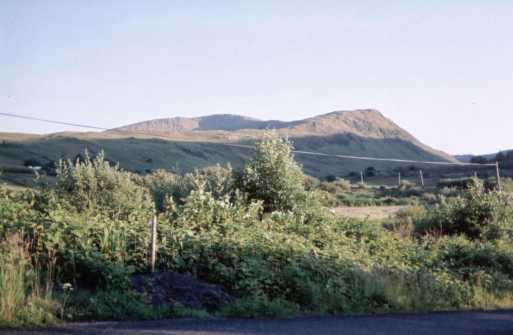 Common Mountain can be linked with a climb of Crocknapeast. From Common, descend to a broad col at G698 848 B (sh 384) before heading south to Crocknapeast. On the descent, you are probably best returning via the same col; a circuit of three hours. From the summit, very steep ground to the north and east points towards a possible circuit from that direction. I started this walk from the scenic viewpoint and carpark (687859 A) at the head of the Glengesh Pass, a fantastic drive up through a steep sided valley along hairpin bends to gain height. At the hairpin bend just below the carpark there is a gate and rough track heading onto the hillside. This is accompanied by a sign saying 'private no entry', joining a plethora of other such signs up through the valley. I politely ignored the sign, dropping down, crossing a stream and started climbing the open hillside. The views along the valley soon open out to include the magnificent coastline of the area, including Slievetooey. 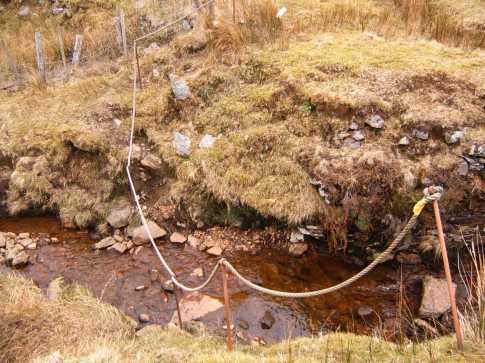 Cross an easy area of peat hags and pick up the remains of an old wall heading uphill. 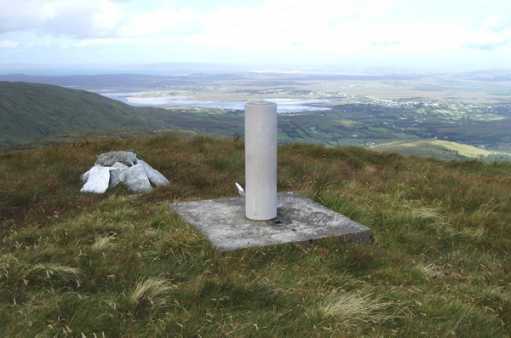 A broad top is reached in 30 mins, with views stretching across Donegal Bay to the clear line of the Sligo Hills and the Ox mtns stretching westwards. 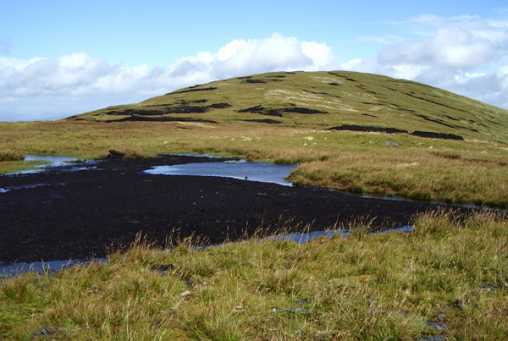 A further 15 mins NE brings the summit of eroded peat and some stone, with a small cairn and 'OS pillar', or concrete filled plastic pipe as it is more commonly known as in these parts. 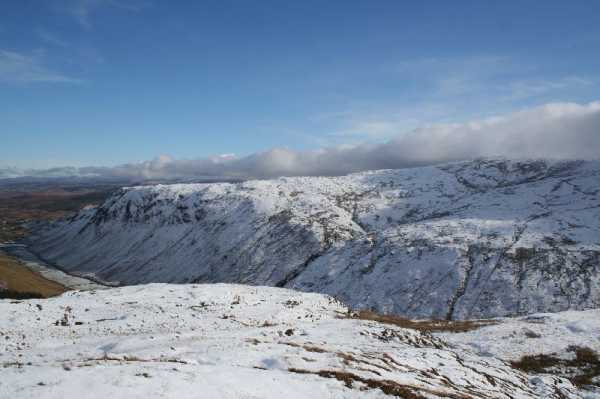 A much more satisfying route is visible from here, taking in the natural horeshoe of steep slopes to the N & E. The views from the summit take in the remainder of Donegals hills - the Bluestacks and the Derryveaghs. To the S I could see the boats in the fishing port of Killybegs. Started from the lay-by near the top of the Glengesh Pass. Walked south past the forestry before squelching SE across boggy moorland. A messy but easy ascent to the skyline brings you to a fence which can be followed for a distance. Gradient steepens slightly before you arrive at the summit, marked with a concrete-filled plastic pipe atop a peaty knoll.